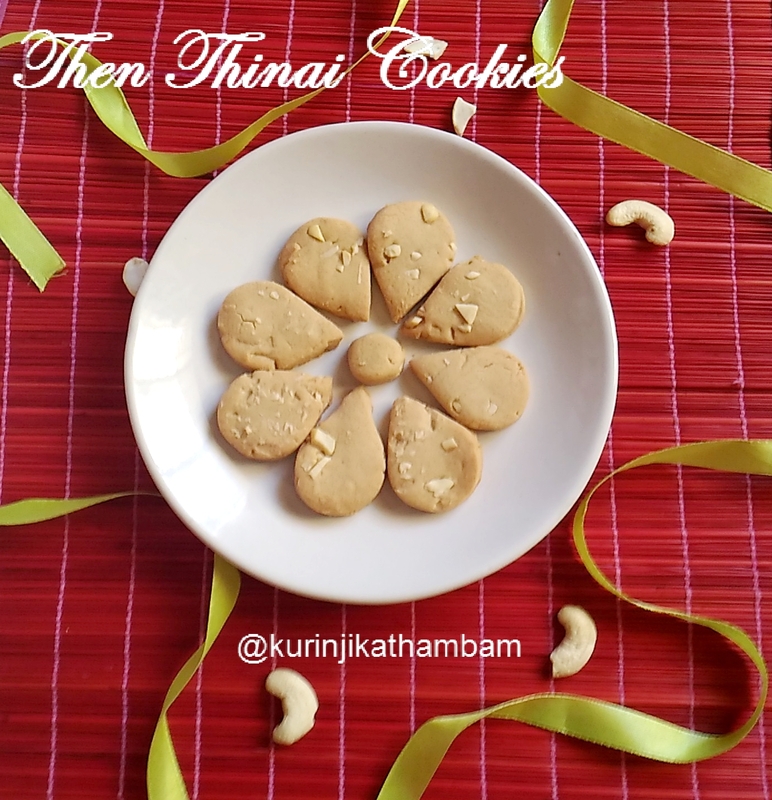 Then Thinai Millet Cookie is a tasty cookie which even kids love to have a lot. It does not contain sugar and hence a great cookie for diabetics patients who do not want to compromise on taste as well. 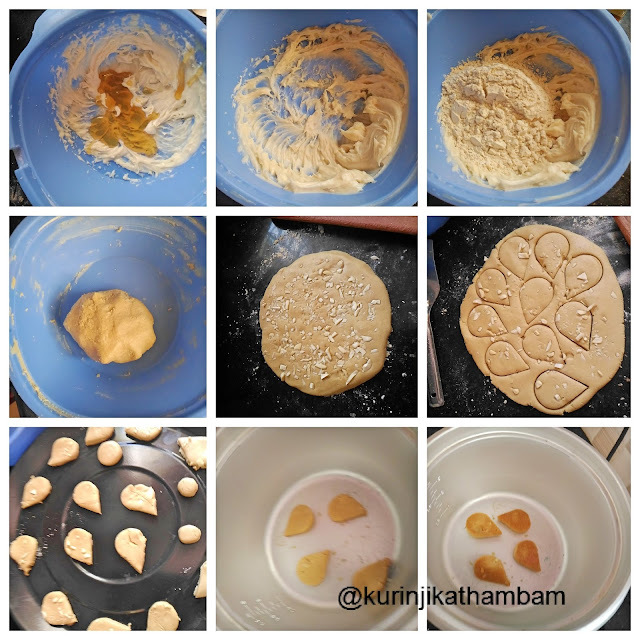 It has only 3 ingredients and hence very easy and quick to make. What better recipe can we hope for? No wonder it is a very popular millet cookie recipe. Preparation Time: 10 mins | Cooking Time: 10 mins | Yields: 20 nos. 1. Add butter in a wide bowl. Beat the butter with electric beater or wire whisk till it become soft. 2. Then add honey and again beat well till they mix them well. 3. Now add the foxtail millet flour and mix with your finger or spoon. 4. Slowly knead it into a soft and pliable dough. Leave it for just one minute. 6. Roll the dough into 1/4 inch thickness circle (like chapathi) on the dry rolling surface using the rolling pin. Before rolling, sprinkle the wheat flour over the rolling surface to avoid the flour getting sticky. 7. Sprinkle the chopped nuts over the circle and press them gently using the rolling pin. 8. Now cut the rolled circle using the cutter of any shape or bottle cap. 11. Bake the cookies for 7 mins at 180 degree Celsius. 14. Now open the lid and arrange the cookies and leave ½ inch space between the cookies. 15. Again close the lid of the cooker and press ON (suppose it doesn’t come to ON mode, wait for 1 -2 mins). 16. After 1-2 mins it will again come to WARM mode. Leave it for 1 min. Repeat the above steps 15 and 16 for one more time. 17. Now turn over the cookies carefully and repeat the steps 15 and 16 again for one more time. 18. Allow it to cool down completely and then take the cookies out from the cooker and store it in a air tight container for later use. 1. I grounded the Foxtail millet flour from the foxtail millet rice without soaking in water with our neighborhood flour mill. 2. Use store bought flour too.